Welcome to our activism page! We want do do our little part in helping general aviation, so we’ve decided to start this page, which will hopefully grow into a useful source of information and material for all kinds of pro-aviation purposes! Please contact us if you have ideas and information that would fit here! 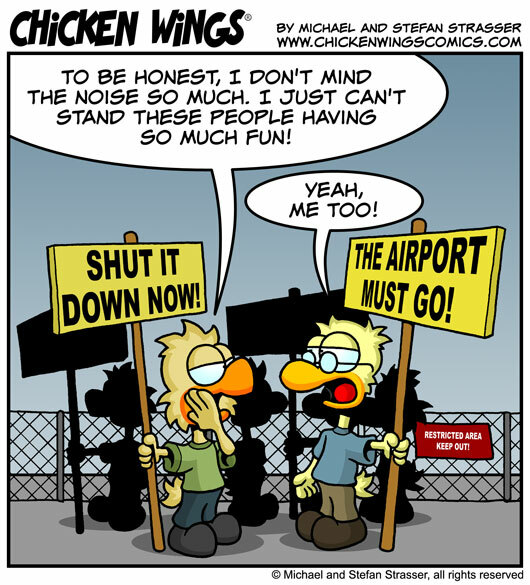 Since we get approached frequently if we can help out with some cartoons by organisations and groups that are fighting for the survival of airports and airfields, we thought we might as well go ahead and provide all our material compiled at one place. So, if you think that you can use any of the cartoons or comic strips below for your cause, please help yourself! No need to ask permission, we hand these here over to the public sphere, as long as it’s for non-profit-use! Below each image, you will find a link to a high-resolution TIFF file that is suitable for print. Also, we’ve added a high-res file with blank talk balloons, so you can either translate it into a different language or adapt it to a specific situation.